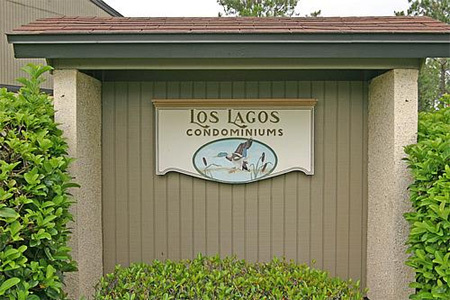 Los Lagos condominiums in Jacksonville, Florida. Los Lagos is a condominium community located in desirable Southside area. Adding to the appeal of Baymeadows is the convenient location, just 10 minutes from downtown Jacksonville and 15 minutes to the Beaches. Built in 1974, Los Lagos and its neighboring residential communities surround the 170-acre Baymeadows golf course. Originally designed by world-renowned architect Desmond Muirhead and Hall of Famer Gene Sarazen, Baymeadows golf course was re-designed by Mark McCumber in 1991. D.R. 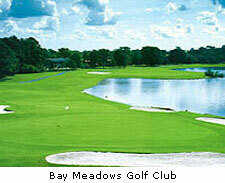 Horton has purchased the golf course in 2004 to build 1,400 residential homes and condominiums at Baymeadows Golf Club. Los Lagos offers homes from 1,501 to 2,198 square feet featuring 2, 3 and 4-bedrooms condo with assigned one car parking space and one carport with storage. Price ranges from the $110's-$180's. Private community with clubhouse and swimming pool.